A tradition started in 2013 will continue to honor those who have given everything for our nation. Instead of the race being 3.1 miles (5K), it will be 3.3 miles. This distance is in memory of the crew of RATCHET 33 who lost their lives on a combat mission as this race was being run in 2012 (Sat, 18 Feb 2012). During those last .2 miles we ask that all runners remember those who have given their lives in the defense of our nation, especially the four heroes that died on this day in 2012. Capt. Ryan P. Hall from the 319th Special Operations Squadron, Capt. 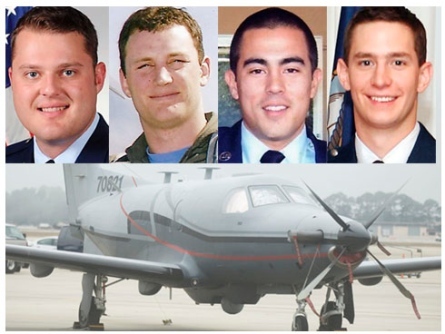 Nicholas S. Whitlock and 1st Lt. Justin J. Wilkens from the 34th Special Operations Squadron and Senior Airman Julian S. Scholten from the 25th Intelligence Squadron died Feb. 18 when their U-28A was involved in an accident near Camp Lemonnier, Djibouti, located in the Horn of Africa. Hall, 30, was a U-28A pilot on his seventh deployment. He entered the Air Force in 2004, receiving his commission through the Reserve Officer Training Corp at The Citadel. He had been assigned to the 319th SOS at Hurlburt Field since 2007 and had more than 1,300 combat flight hours. "Captain Ryan Hall's skill as a pilot, leadership as an officer, and compassion as a friend left an indelible mark on all of us," said Lt. Col. Patrick Daley, commander of the 319th SOS. "A true quiet professional, Ryan's teaching groomed a whole generation of Air Commandos." Whitlock, 29, was also a U-28A pilot and was on his fifth deployment. He entered the Air Force in 2006, receiving his commission through the Officer Training School. He had been assigned to the 319th SOS and then to the 34th SOS at Hurlburt Field since 2008 and had more than 800 combat flight hours. "Nick was a disciplined warrior," said Lt. Col. William Winans, director of operations for the 34th SOS. "He knew the risks associated with our mission-set, and he mitigated those risks through his technical competence and his charismatic leadership style." Wilkens, 26, was a combat systems officer on his third deployment. He entered the Air Force in 2009, receiving his commission through the Air Force Academy. He had been assigned to the 34th SOS at Hurlburt Field since April 2011 and had more than 400 combat hours. "Justin didn't just have a highlight reel from the field of battle," Winans said. "He did it all, from teaching English classes to security forces, to being the go-to guy with all the high-tech systems on the airplane. There was nothing he didn't do exceptionally well." Scholten, 26, was a mission systems operator assigned to the 25th IS at Hurlburt Field since 2009. He enlisted in the Air Force in 2007. He had more than 900 combat hours in six different airframes and was on his third deployment. "During his initial two deployments, Julian literally wrote the book on how to conduct our operations, an amazing feat for a young Airman fresh through the pipeline," said Lt. Col. Matthew Atkins, commander of 25th IS. "Airman Scholten's excellence as an Airman was a direct reflection of his personality and character, and his smile was as quick as his wit."